[S35] Gene Carlton Clopton, The Ancestors and Descendants of William Clopton of York County, Virginia (Atlanta, Ga.: Phoenix Printing, Inc., 1984), pp. 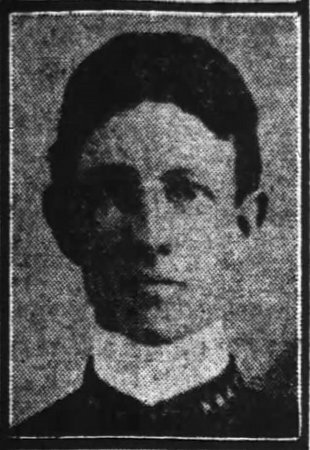 109-10 (naming Patrick Henry Clopton as her father; attributing information to Lydia M. McKay Jones, Ada Sanderson of Cumberland Co., Va., Gene Clopton, Atlanta, and Alice Clopton, Omaha, Neb.). [S35] Gene Carlton Clopton, The Ancestors and Descendants of William Clopton [etc. ], above, pp. 109-10 (naming Harriet Dowles as her mother). [S35] Gene Carlton Clopton, The Ancestors and Descendants of William Clopton [etc. ], above, p. 110 (giving the date but not the place; attributing information to Lydia M. McKay Jones, Ada Sanderson of Cumberland Co., Va., Gene Clopton, Atlanta, and Alice Clopton, Omaha, Neb.). [S312] Social Security Death Index, online at http://tinyurl.com/AncestrySSDI, viewed on 27 Jul 2004 (stating that she died on 29 Mar 1984; not naming the place of death but stating that she lived in Elgin, Tex. when she died). [S312] Social Security Death Index, online at http://tinyurl.com/AncestrySSDI, viewed on 30 Apr 2006 (stating that he died in Apr 1987; not naming the place of death but stating that he lived in Wills Point, Texas when he died). [S925] Rossiter Johnson, ed.,The Twentieth Century Biographical Dictionary of Notable Americans (Boston, Mass. : The Biographical Soc'y, 1904, vol. 7, p. 311 (naming Elizabeth Fortson as his mother), as contained on Ancestry Reference Library 2000, Deluxe Ed (compact disk published by Ancestry, Inc.). [S925] Rossiter Johnson, ed., The Twentieth Century Biographical Dictionary of Notable Americans, above, vol. 7, p. 311 (naming Simeon Maxwell as his father). [S925] Rossiter Johnson, ed., The Twentieth Century Biographical Dictionary of Notable Americans, above, vol. 7, p. 311. [S925] Rossiter Johnson, ed., The Twentieth Century Biographical Dictionary of Notable Americans, above, vol. 7, pp. 311-12. [S925] Rossiter Johnson, ed., The Twentieth Century Biographical Dictionary of Notable Americans, above, vol. 7, p. 312. [S925] Rossiter Johnson, ed.,The Twentieth Century Biographical Dictionary of Notable Americans (Boston, Mass. : The Biographical Soc'y, 1904, vol. 7, pp. 312 (naming Arthur Brockenborough as her father), as contained on Ancestry Reference Library 2000, Deluxe Ed (compact disk published by Ancestry, Inc.). [S925] Rossiter Johnson, ed., The Twentieth Century Biographical Dictionary of Notable Americans, above, vol. 7, pp. 312 (naming Lucy _____ as her mother). [S925] Rossiter Johnson, ed., The Twentieth Century Biographical Dictionary of Notable Americans, above. [S925] Rossiter Johnson, ed., The Twentieth Century Biographical Dictionary of Notable Americans, above, vol. 7, pp. 312. [S925] Rossiter Johnson, ed.,The Twentieth Century Biographical Dictionary of Notable Americans (Boston, Mass. : The Biographical Soc'y, 1904, vol. 7, p. 312 (naming Chief Justice Walker as her father), as contained on Ancestry Reference Library 2000, Deluxe Ed (compact disk published by Ancestry, Inc.). [S925] Rossiter Johnson, ed., The Twentieth Century Biographical Dictionary of Notable Americans, above, vol. 7, p. 312 (naming Phoebe Hawks as her mother). [S926] Betty and Dwayne Beard, Van Zandt County, Texas Cemeteries, Book 2 (n.p. : n.pub., 1977), p. 5 (naming John R. Kellis as his father). Marriage*: She married Alexander Kellam Rusk, son of Capt. John Cleveland Rusk and Cornelia E. Garrison. [S926] Betty and Dwayne Beard, Van Zandt County, Texas Cemeteries, Book 2 (n.p. : n.pub., 1977), p. 4. Marriage*: She married Thomas Patton Rusk, son of Capt. John Cleveland Rusk and Harriet Ann Patton. [S926] Betty and Dwayne Beard, Van Zandt County, Texas Cemeteries, Book 2 (n.p. : n.pub., 1977), p. 21. Marriage*: He married Lucy _____. Marriage*: She married Arthur Brockenborough. [S925] Rossiter Johnson, ed.,The Twentieth Century Biographical Dictionary of Notable Americans (Boston, Mass. : The Biographical Soc'y, 1904, vol. 7, pp. 312 (naming Lucy _____ as her mother), as contained on Ancestry Reference Library 2000, Deluxe Ed (compact disk published by Ancestry, Inc.). Marriage*: He married Phoebe Hawks. Marriage*: She married Chief Justice _____ Walker. [S925] Rossiter Johnson, ed.,The Twentieth Century Biographical Dictionary of Notable Americans (Boston, Mass. : The Biographical Soc'y, 1904, vol. 7, p. 312 (naming Phoebe Hawks as her mother), as contained on Ancestry Reference Library 2000, Deluxe Ed (compact disk published by Ancestry, Inc.). [S930] Elbert County Cemeteries, Vol. 1 (n.p. : n.pub., 2002), pp. 149 (stating that she was the wife of Robert W. Fortson), 150 (stating that he was the husband of Janie Fulton). [S930] Elbert County Cemeteries, Vol. 1 (n.p. : n.pub., 2002), p. 153. [S930] Elbert County Cemeteries, Vol. 1 (n.p. : n.pub., 2002), pp. 152 (stating that he was the husband of Willie Brown), 153 (stating that she was the second wife of J. Matt Oglesby). [S930] Elbert County Cemeteries, Vol. 1 (n.p. : n.pub., 2002), p. 166 (naming Ellen Hill as his mother). [S929] Early Cemeteries and Gravestones Elbert County, Georgia (Elberton, Ga.: Elbert County Hist. Soc'y, 1874), p. 63 (naming Ellen H. Fortson as his mother). [S930] Elbert County Cemeteries, Vol. 1 (n.p. : n.pub., 2002), p. 166 (naming Stephen Ham Fortson as his father). [S929] Early Cemeteries and Gravestones Elbert County, Georgia (Elberton, Ga.: Elbert County Hist. Soc'y, 1874), p. 63 (naming Stephen H. Fortson as his father). [S930] Elbert County Cemeteries, Vol. 1 (n.p. : n.pub., 2002), p. 668 (naming Francis Benjamin Fortson, Sr. as her father). [S27] John Wright Boyd, A Family History: Lt. Thomas Fortson (1742-1824) and Some of His Descendants—Early Settler of Elbert County, Georgia (Danielsville, Ga.: Heritage Papers, 1973), p. 115 (naming Francis Benjamin Fortson as her father). [S929] Early Cemeteries and Gravestones Elbert County, Georgia (Elberton, Ga.: Elbert County Hist. Soc'y, 1874), p. 13 (naming F. B. Fortson as her father). [S930] Elbert County Cemeteries, Vol. 1 (n.p. : n.pub., 2002), p. 668 (naming Alice Carrie Brock as her mother). [S27] John Wright Boyd, A Family History: Lt. Thomas Fortson, etc., above, p. 115 (naming Alice Carrie Brock as her mother). [S930] Elbert County Cemeteries, Vol. 1 (n.p. : n.pub., 2002), p. 668. [S27] John Wright Boyd, A Family History: Lt. Thomas Fortson, etc., above, p. 115. [S929] Early Cemeteries and Gravestones Elbert County, Georgia (Elberton, Ga.: Elbert County Hist. Soc'y, 1874), p. 13. [S312] Social Security Death Index, online at http://tinyurl.com/AncestrySSDI, viewed on 9 May 2004. [S312] Social Security Death Index, online at http://tinyurl.com/AncestrySSDI, viewed on 9 May 2004 (stating that she died in Jun 1980; not naming the place of death but stating that she lived in Elberton, Ga. when she died). [S930] Elbert County Cemeteries, Vol. 1 (n.p. : n.pub., 2002), p. 669 (naming Ruth Moore Fortson as his mother). [S930] Elbert County Cemeteries, Vol. 1 (n.p. : n.pub., 2002), p. 668 (naming Francis Benjamin Fortson, Sr. as his father). [S27] John Wright Boyd, A Family History: Lt. Thomas Fortson (1742-1824) and Some of His Descendants—Early Settler of Elbert County, Georgia (Danielsville, Ga.: Heritage Papers, 1973), p. 115 (naming Francis Benjamin Fortson as his father). [S929] Early Cemeteries and Gravestones Elbert County, Georgia (Elberton, Ga.: Elbert County Hist. Soc'y, 1874), p. 14 (giving his name as Charlie Brock Fortson and naming F. B. Fortson as his father). [S930] Elbert County Cemeteries, Vol. 1 (n.p. : n.pub., 2002), p. 668 (naming Alice Carrie Brock as his mother). [S27] John Wright Boyd, A Family History: Lt. Thomas Fortson, etc., above, p. 115 (naming Alice Carrie Brock as his mother). [S930] Elbert County Cemeteries, Vol. 1 (n.p. : n.pub., 2002), p. 668 (giving his name as Charly Brock Fortson). [S929] Early Cemeteries and Gravestones Elbert County, Georgia (Elberton, Ga.: Elbert County Hist. Soc'y, 1874), p. 14 (giving his name as Charlie Brock Fortson). [S930] Elbert County Cemeteries, Vol. 1 (n.p. : n.pub., 2002), p. 669 (naming Alice Carrie Brock as his mother). [S27] John Wright Boyd, A Family History: Lt. Thomas Fortson (1742-1824) and Some of His Descendants—Early Settler of Elbert County, Georgia (Danielsville, Ga.: Heritage Papers, 1973), p. 115 (naming Alice Carrie Brock as his mother). [S930] Elbert County Cemeteries, Vol. 1 (n.p. : n.pub., 2002), p. 669 (naming Francis Benjamin Fortson, Sr. as his father). [S27] John Wright Boyd, A Family History: Lt. Thomas Fortson, etc., above, p. 115 (naming Francis Benjamin Fortson as his father). [S930] Elbert County Cemeteries, Vol. 1 (n.p. : n.pub., 2002), p. 669 (giving the year but not the month or day). [S27] John Wright Boyd, A Family History: Lt. Thomas Fortson, etc., above, pp. 115 (giving the date but not the place), 116. [S27] John Wright Boyd, A Family History: Lt. Thomas Fortson, etc., above, p. 116. [S312] Social Security Death Index, online at http://tinyurl.com/AncestrySSDI, viewed on 9 May 2004 (stating that he died in Sep 1981; not naming the place of death but stating that he lived in Elberton, Ga. when he died). [S930] Elbert County Cemeteries, Vol. 1 (n.p. : n.pub., 2002), p. 669 (naming George Thomas Fortson as her father). [S930] Elbert County Cemeteries, Vol. 1 (n.p. : n.pub., 2002), p. 669 (naming Tallulah Hill Fortson as her mother). [S930] Elbert County Cemeteries, Vol. 1 (n.p. : n.pub., 2002), p. 669 (misstating the year as 1996). [S961] Find A Grave, online at http://www.findagrave.com, memorial for Frank Stephen Fortson, Jr., memorial no. 44204670, viewed on 30 Sep 2012 (giving the date but not the place). [S930] Elbert County Cemeteries, Vol. 1 (n.p. : n.pub., 2002), pp. 669 (stating that he was the husband of Mary Frances Thornton but not giving the marriage date), 670 (stating that she was the wife of Frank Stephen Fortson, Jr. but not giving the marriage date). [S27] John Wright Boyd, A Family History: Lt. Thomas Fortson (1742-1824) and Some of His Descendants—Early Settler of Elbert County, Georgia (Danielsville, Ga.: Heritage Papers, 1973), p. 693. [S961] Find A Grave, online, above, memorial for Frank Stephen Fortson, Jr., memorial no. 44204670, viewed on 30 Sep 2012. [S27] John Wright Boyd, A Family History: Lt. Thomas Fortson, etc., above, p. 693 (stating that he was born on 25 Apr 1917 in Tignall, Georgia). [S930] Elbert County Cemeteries, Vol. 1 (n.p. : n.pub., 2002), p. 669 (stating that he was born on 25 Jul 1917). [S961] Find A Grave, online, above, memorial for Frank Stephen Fortson, Jr., memorial no. 44204670, viewed on 30 Sep 2012 (stating that he was born on 25 Jul 1917). [S961] Find A Grave, online at http://www.findagrave.com, memorial for Mary Frances Thornton Fortson, memorial no. 44204706, viewed on 30 Sep 2012. [S312] Social Security Death Index, online at http://tinyurl.com/AncestrySSDI, viewed on 9 May 2004 (stating that she died in Sep 1978; not naming the place of death but stating that last benefits were sent to an address in Elberton, Ga.). [S312] Social Security Death Index, online at http://tinyurl.com/AncestrySSDI, viewed on 9 May 2004 (giving the month and year). [S930] Elbert County Cemeteries, Vol. 1 (n.p. : n.pub., 2002), p. 670 (giving only the year). [S27] John Wright Boyd, A Family History: Lt. Thomas Fortson (1742-1824) and Some of His Descendants—Early Settler of Elbert County, Georgia (Danielsville, Ga.: Heritage Papers, 1973), p. 116. [S312] Social Security Death Index, online at http://tinyurl.com/AncestrySSDI, viewed on 9 May 2004 (stating that she died in Mar 1979; not naming the place of death but stating that she lived in Elberton, Ga. when she died). [S312] Social Security Death Index, online at http://tinyurl.com/AncestrySSDI, viewed on 9 May 2004 (stating that she died on 23 Oct 2001; not naming the place of death but stating that she lived in Elberton, Ga. when she died). [S930] Elbert County Cemeteries, Vol. 1 (n.p. : n.pub., 2002), p. 669 (naming Josephine Thornton as this child's mother). [S930] Elbert County Cemeteries, Vol. 1 (n.p. : n.pub., 2002), p. 669 (naming Josephine Thornton as his mother). Lovick G. Fortson, ca. 1904. • His memorial page at Find A Grave is here. [S930] Elbert County Cemeteries, Vol. 1 (n.p. : n.pub., 2002), p. 670 (naming George Thomas Fortson as his father). [S930] Elbert County Cemeteries, Vol. 1 (n.p. : n.pub., 2002), p. 670 (naming Tallulah Hill Fortson as his mother). [S961] Find A Grave, online at http://www.findagrave.com, memorial for Lovick G. Fortson, memorial no. 44204701, viewed on 30 Jul 2011. [S930] Elbert County Cemeteries, Vol. 1 (n.p. : n.pub., 2002), p. 671 (naming George Thomas Fortson as his father). [S930] Elbert County Cemeteries, Vol. 1 (n.p. : n.pub., 2002), p. 671 (naming Tallulah Hill Fortson as his mother). [S930] Elbert County Cemeteries, Vol. 1 (n.p. : n.pub., 2002), p. 671. [S930] Elbert County Cemeteries, Vol. 1 (n.p. : n.pub., 2002), p. 671 (naming Francis Benjamin Fortson, Sr. as his father). [S929] Early Cemeteries and Gravestones Elbert County, Georgia (Elberton, Ga.: Elbert County Hist. Soc'y, 1874), p. 14 (naming F. B. Fortson as his father). [S930] Elbert County Cemeteries, Vol. 1 (n.p. : n.pub., 2002), p. 671 (naming Alice Carrie Brock as his mother). [S929] Early Cemeteries and Gravestones Elbert County, Georgia (Elberton, Ga.: Elbert County Hist. Soc'y, 1874), p. 14. [S312] Social Security Death Index, online at http://tinyurl.com/AncestrySSDI, viewed on 9 May 2004 (stating that he died on 29 Jan 1990; not naming the place of death but stating that he lived in Bowman, Ga. when he died). [S27] John Wright Boyd, A Family History: Lt. Thomas Fortson, etc., above, p. 115 (naming Hoke Smith, Sr. Fortson as her father). [S930] Elbert County Cemeteries, Vol. 1 (n.p. : n.pub., 2002), p. 668 (giving her name as Carrie Lou Fortson and naming F. B. Fortson as her father). [S929] Early Cemeteries and Gravestones Elbert County, Georgia (Elberton, Ga.: Elbert County Hist. Soc'y, 1874), p. 14 (giving her name as Carrie Lou Fortson and naming F. B. Fortson as her father). [S930] Elbert County Cemeteries, Vol. 1 (n.p. : n.pub., 2002), p. 668 (giving her name as Carrie Lou Fortson). [S929] Early Cemeteries and Gravestones Elbert County, Georgia (Elberton, Ga.: Elbert County Hist. Soc'y, 1874), p. 14 (giving her name as Carrie Lou Fortson). [S930] Elbert County Cemeteries, Vol. 1 (n.p. : n.pub., 2002), p. 669 (stating that she was the first wife of George Haley Fortson without giving the date). [S312] Social Security Death Index, online at http://tinyurl.com/AncestrySSDI, viewed on 9 May 2004 (stating that he died in May 1963; not naming the place of death but stating that he lived in Georgia when he died). [S27] John Wright Boyd, A Family History: Lt. Thomas Fortson (1742-1824) and Some of His Descendants—Early Settler of Elbert County, Georgia (Danielsville, Ga.: Heritage Papers, 1973), p. 116 (naming G. Boles Bunch as her father). [S27] John Wright Boyd, A Family History: Lt. Thomas Fortson, etc., above, p. 116 (naming Ossie Cofer as her mother). [S27] John Wright Boyd, A Family History: Lt. Thomas Fortson, etc., above, pp. 115 (giving the date but not the place), 117. [S312] Social Security Death Index, online at http://tinyurl.com/AncestrySSDI, viewed on 14 Feb 2004 (giving the date but not the place). [S312] Social Security Death Index, online at http://tinyurl.com/AncestrySSDI, viewed on 14 Feb 2004 (not naming the place of death but stating that he lived in Marietta, Ga. when he died). [S27] John Wright Boyd, A Family History: Lt. Thomas Fortson, etc., above, p. 117. [S312] Social Security Death Index, online at http://tinyurl.com/AncestrySSDI, viewed on 14 May 2006 (stating that he died on 29 May 2004; not naming the place of death but stating that he lived in Elberton, Georgia when he died). [S27] John Wright Boyd, A Family History: Lt. Thomas Fortson (1742-1824) and Some of His Descendants—Early Settler of Elbert County, Georgia (Danielsville, Ga.: Heritage Papers, 1973), p. 115 (naming Hoke Smith, Sr. Fortson as her father). [S930] Elbert County Cemeteries, Vol. 1 (n.p. : n.pub., 2002), p. 669 (naming Julian Fortson as this child's father). [S930] Elbert County Cemeteries, Vol. 1 (n.p. : n.pub., 2002), p. 669 (naming Julian Fortson as his father).